No matter what season you come to visit, don’t miss out on these truly unique Traverse City attractions. Traverse City is known as the Cherry Capital of the World! Open year-round, Cherry Republic is known for their wide variety of cherry favorites, offering everything from cherry wine and sodas to fresh-baked cherry pies, ice cream, and their award-winning cherry chili. Stop in and grab some souvenirs to commemorate your trip to the Cherry Capital of the World. Take a step back in time at this historic drive-in theatre, open since 1953. Enjoy delicious homemade items from the Cherry Bowl Diner, pick up a souvenir at Cherry Bowl Gifts and Goodies, and catch a family-friendly double feature every summer night in June, July and August. Once voted as the #1 “Most Beautiful Place in America” by ABC’s Good Morning America, Sleeping Bear Dunes is a must-see natural attraction. 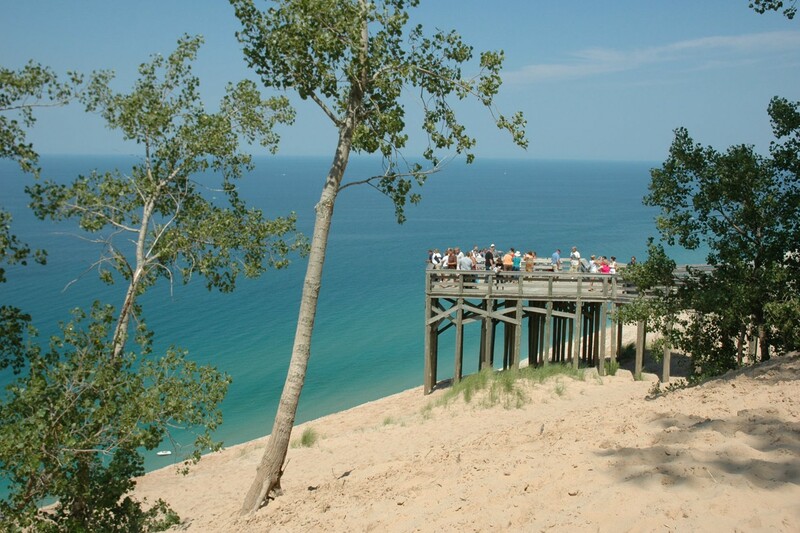 This national landmark is made up of over 50,000 acres containing unspoiled, sugar-sand beaches, mountainous dune, islands and inland lakes. Open year-round, visitors will also love exploring over 100 miles of nature trails. Treat the whole family to an unforgettable ferry trip to the famous Beaver Island, known as "America's Emerald Isle." Visitors can enjoy beautiful beaches, hiking/biking trails, kayaking, canoeing and guided tours. Ferries run daily every June through September. Baseball-lovers will enjoy cheering on the Traverse City home team at our beautiful baseball park. Now part of the Northwoods League (which boasts distinguished alumni such as Major League stars Max Scherzer, Curtis Granderson, Brandon Crawford, and Jordan Zimmerman), the Pit Spitters provide a great interactive experience for all types of baseball fans. Sure, summertime in Traverse City is fun, but don't miss out on all the winter fun Northern Michigan has to offer! Explore the slopes at Shanty Creek Resorts or Hickory Hills, go tubing down Mount Holiday, or visit Crystal Mountain Resort where you can enjoy ice skating, snowmobiling and even dog sledding.